Mystical, mythical dragons emerging from the darkness. Rainbow dragons with scales that gleam like gems. 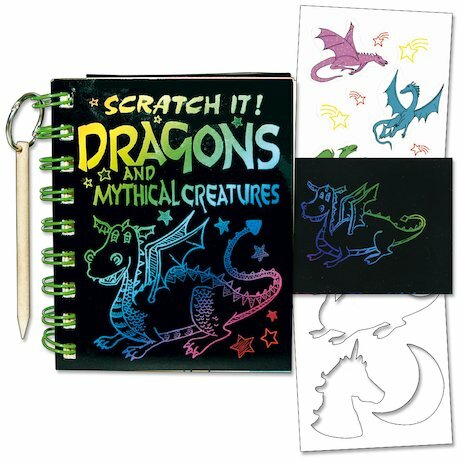 Scratch them out and set them free with a book of creative fun where all these magical creatures come alive! This booklet has all the cool kit you need to get started – plus instructions on how to scratch all sorts of dragons, a mermaid, a sea serpent and more! Contains a 32-page book, 12 sheets of special scratching card, envelopes, stickers and a wooden scratch pen.